Download Your FREE DIY Perfume Guide! This Anti-aging Toner is infused with green tea and the most effective anti-aging essential oils. It is so easy to make and will leave your skin feeling so fresh and clean! There's something so freeing, so liberating and rewarding about scooping dozens of skin products off your bathroom counter straight into the trash. When you go all natural and green, life becomes more simpler and you have no need for a gazillion different beauty products. For instance, apple cider vinegar is a staple in most homes and it's a universal tool in the kitchen, cleaning, and facial products. When I took a natural approach to skin care regimen, by default, I took a simpler approach to taking care of my skin naturally. That involved a lot of the same ingredients but in different forms and quantities. Coconut oil can be used as an overall moisturizer as well as an ingredient in homemade toothpaste. Something that would have required two separate products can now be made out of one. Simple. Life becomes more…simple. 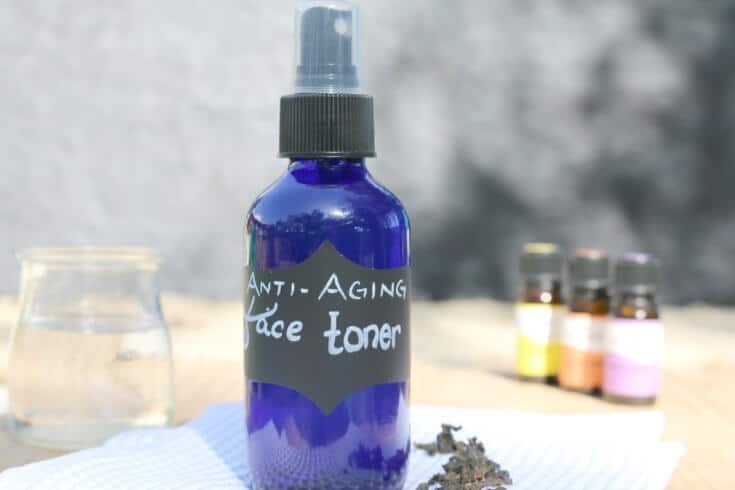 And as such, this toner made with anti-aging ingredients is simple too because chances are, you already have most of the ingredients on hand. I also take it a step further to include more nutrients by using green tea and witch hazel in this concoction. Green tea contains a high amount of anti-oxidants, enzymes and amino acids. Historically, oriental cultures have used green tea medicinally for centuries to treat everything from headaches to depression. But green tea also has incredible benefits for the skin. Anti-aging benefits: green tea can help delay skin aging such as sun damage, age spots, fine lines and wrinkles. Reduces dark circles and puffy eyes: green tea contains tannins and antioxidants that help shrink blood vessels underneath the delicate skin around the eyes thus reducing the swelling. In addition to green tea, witch hazel brings astrigent properties to this toner. With hazel has strong antioxidant attributes that kill bacteria deep within the skin's pores. As a result, witch hazel makes a great choice as a natural acne treatment. Witch hazel may also help tighten the skin and fade discolored spots, old acne marks and sun spots. 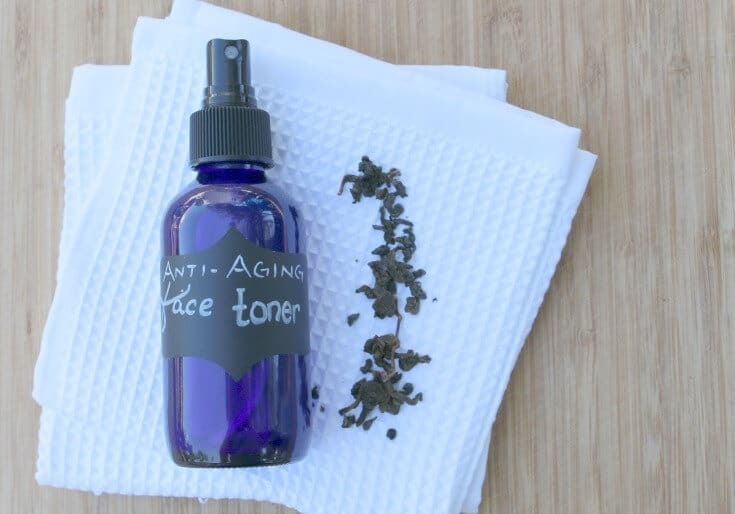 As you can see both green tea and witch hazel serve an important role in this Anti-Aging Toner. Combine this with other skin-healing oils listed below and you have a wonderful homemade product for your skin. Use any combination of the oils listed above to have a combined total of 10 drops. Please note, carrot seed oil and ctirus oils should be applied to face only in the evening as there is a potential risk of sun sensitivity. Though it's incredibly good for anti-aging products, you can swap that with another oil in order to avoid photosensitizing side effects on your face. I still add it to my toner but use it in the mornings only on days when I know I won't be out in the sun a lot. Use your better judgment on this. Steep green tea overnight to extract all the benefits of green tea. Steeping it overnight also allows for it to cool down completely. Pour 1/2 cup of green tea in a spray bottle, add 1/4 cup of witch hazel and a total of 10 drops of essential oils. Close the lid on the bottle and shake vigorously. Spray directly on face and pat with clean hands. The toner will dry quickly. 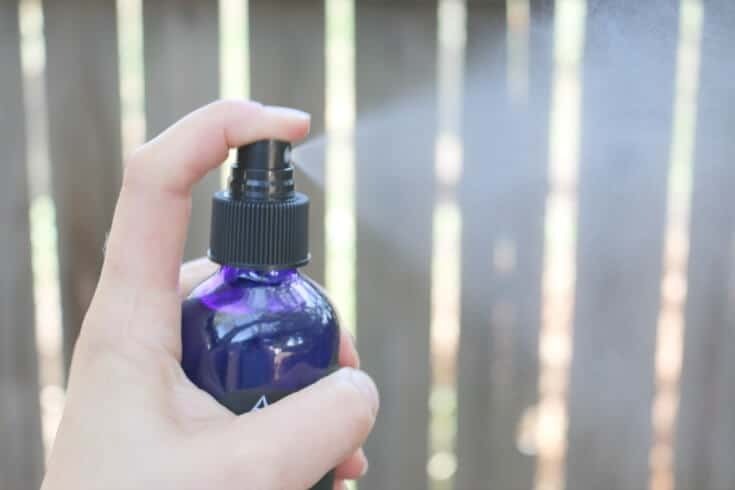 Pour ½ cup of green tea in a spray bottle, add ¼ cup of witch hazel and a total of 10 drops of essential oils. Use this toner as you would any other toner. It leaves your face clean and refreshing, just the way a face should feel. Love my essential oils, I’m always making new recipes , this is a must try. Essential oils for life! I have never tried witch hazel before, sounds like a great one though! (Shh, they all are great). 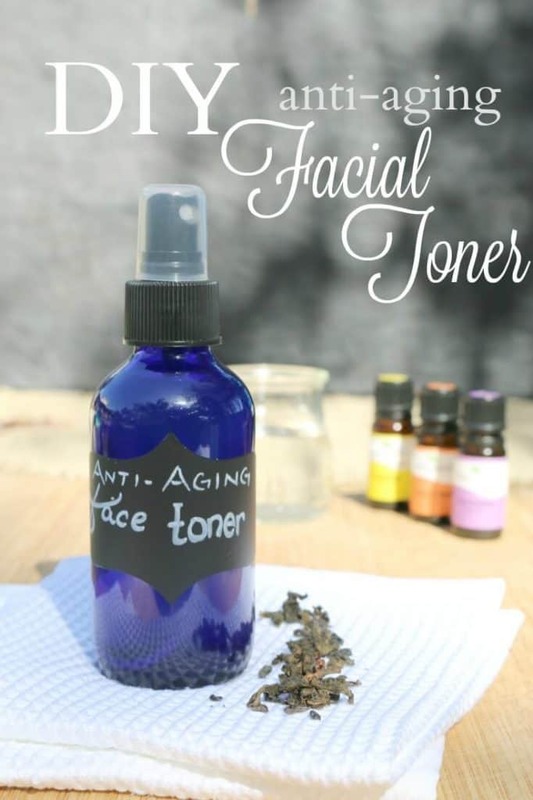 It’s so nice to pamper our skin with this Simple DIY Anti-Aging Facial Toner. Thank you for sharing this natural recipe with us at the Healthy Happy Green Natural Party! I’m Pinning and sharing this! This looks great. I tend not to use toners, because they are often very drying, but I may give this one a try. (Is it 1/4 cup for the witch hazel?) Thanks so much for sharing with the Let’s Get Real party. Which part of witch hazel do you use in this recipe? (Extract? <- with alcohol? Bark? Leaf? Leaf powder?…). Thanks! You would use the extract. The link to the one I use is in the recipe card. Thanks! Also, this will be my featured post at this week’s Let’s Get Real party. I’m much more interested in anti-aging products the older I get. I appreciate homemade products since I know exactly what’s in them. Thanks for sharing at the #ThisIsHowWeRoll Link Party. This sounds great! Love the green tea. Thanks so much for sharing this with us at Savoring Saturdays linky party! I need to make some of this. I used to use just witch hazel as my toner, never thought about adding green tea.